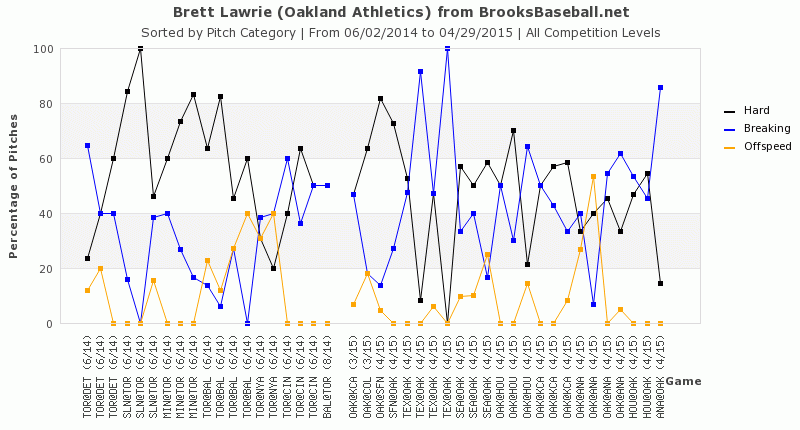 Brett Lawrie doesn’t really have a problem with breaking balls, not if you zoom out on his career. He’s whiffed on sliders (14%) and curves (8%) at about an average rate (13% and 11%, respectively), which follows his overall whiff rates (8.6% for Lawrie, 8.5% is average). 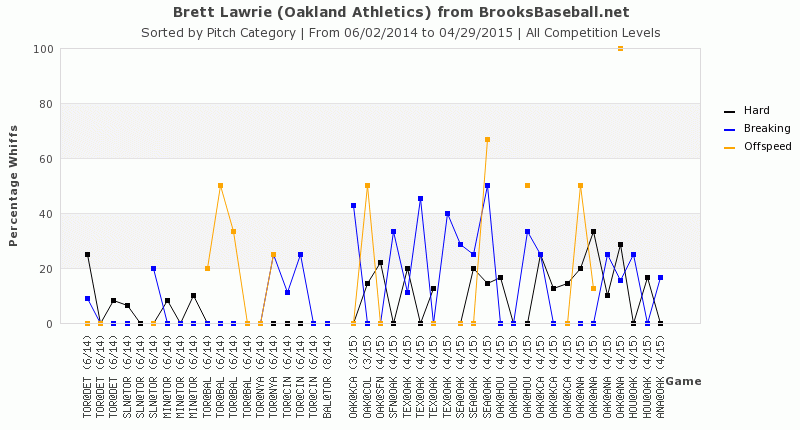 Opening week, in three games against the Rangers, Lawrie saw ten straight breaking balls… twice. He’d never seen ten straight breaking balls before. “They’re not going to stop until I make an adjustment,” Lawrie admitted before a game with the Mariners. But that statement’s not enough to uncover what it’s like to see a barrage of breaking balls like Lawrie did. And what it means, and how you claw your way out of a hole like the one he found himself in. When we say something has gotten into the head of a player, this is probably what we’re talking about. It’s a spiral staircase and you’re wearing slippers made of butter. Surprising that this hasn’t happened before, given the outcomes in the Ranger series. Tony Sipp and Jairo Asencio threw him eight straight breaking balls in 2012. Hiroki Kuroda and Cody Eppley threw Lawrie 11 breaking balls in 16 pitches that same year. Kuroda, David Phelps, and David Robertson went to the breaker 10 times in 12 straight pitches later that year. Kuroda and Joba Chamberlain threw 11 breaking balls of 13 the next year. Well, look at that. Hiroki Kuroda loved throwing breaking balls to Brett Lawrie. 61% of the pitches he threw Lawrie were either sliders or curves. That’s twice as often as he’s thrown breaking balls in general. Kuroda got swinging strikes on a third of the breaking balls he threw Lawrie, too, despite the fact that Lawrie only whiffs on 14% of sliders and 8% of the curves he’s seen over his career. Maybe Kuroda just had something figured out those days. But then you’ll notice that Ivan Nova threw Lawrie seven out of nine breaking balls in a row in 2011, and you check who was behind the plate for these Yankee outings, and… there it is: Russell Martin was calling the game both times. Lawrie had plenty to say about the catcher’s role in his three outings against the Rangers. In the first game of the series, Lawrie saw 11 straight breaking balls from Colby Lewis, Keone Kela, and Neftali Feliz and in the third game, he saw 10 straight from Nick Martinez — Carlos Corporan was behind the plate in both games. Robinson Chirinos caught the game in between, “With a different type of style, but still breaking balls,” thought Lawrie. “It was just what their approach was against me during the series.” When Lawrie singled off of two straight sliders from Ross Detwiler and Logan Verrett in the game after the four-strikeout night, he thought he’d done enough to change their approach, though. “I thought I had capitalized,” the third baseman said. But Corporan came back the next night and called for ten straight curves and sliders from Nick Martinez. He whiffed on four of them, so the quantity approach did once again cause some contact issues for Lawrie. But he also managed a single (and a ball in play), and credited a change in approach as well as some extra research for the better results. Lawrie swung at half the pitches he saw the night he struck out four times. He saw six called strikes that day. The next two nights, he swung over two-thirds of the time. He saw four called strikes in the two games combined. He was surprised to see ten straight breaking balls in the final game of the series, but he wasn’t upset. “I thought I’d made the adjustment,” he said. “They were still doing it, and I didn’t have an issue with it because I started seeing it better and better, especially since I started seeing the same guys. Since, pitchers have continued to go to breaking balls, but rarely as often as those two nights in Texas. So that was the other thing that Lawrie did after his bad night — research. He went and talked to people that had played with Corporan and Chirinos, and tried to find out about how they called the game. “Everyone’s played against each other and with each other, so now I feel if I can branch out a little and get some information from any one of these guys,” Lawrie said. “That’s just a little bit better information. It certainly seems like certain catchers call different games against Lawrie. He should be worried about seeing the Blue Jays this year if this table holds. Brett Lawrie had never seen ten breaking balls in a row until last week, and then it happened twice in three games. He took his lumps and made an adjustment — “You gotta understand they are going to do that again. You gotta go into attack mode,” as he put it — and also went and gathered more information about the guys calling the games. Seems that’s about all you can do in a situation like this. If the adjustments work — and it looks like his whiff percentage against breaking pitches is down recently — it could be another two years until he sees a flurry like this again. We hoped you liked reading Brett Lawrie Saw 10 Straight Breaking Balls, Twice by Eno Sarris! McHugh knew on April 1 when he threw a cutter that bounced in front of the LHB box as Lawrie offered. You guys still need that gif!